Sunbathing is one of inevitable ‘activities’ both on the deck of your charter yacht and on your favorite beach. The new dimension of sunbathing appears when listening to your favorite music for relaxation instead of crowd and noises around you. The answer was given by EcoXpro Waterproof Smartphone Case. This waterproof case by EcoXgear Company not only protects your smarphone, credit cards, cash, keys or other valuables of small size but also plays your favorite music while sunbathing on the deck of your charter yacht. 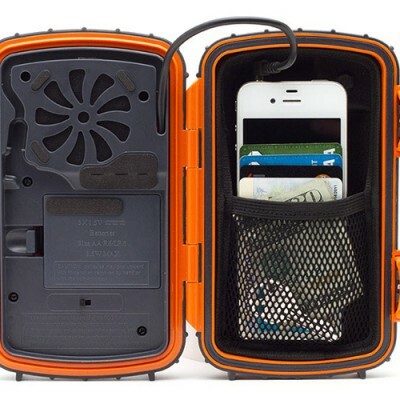 Integrated 3-inch speaker system makes this waterproof case a mobile music box. Only three AA-size batteries will make this device play your favourite music from your smartphone or MP3 player for some 30 hours. In case that other crew members disagree with your music taste or the loudness level, there is an integrated waterproof headphones port as well. EcoXgear EcoXpro can easily be attached to your backpack, belt or some deck equipment with a carabiner clip while there is no fear for the case if accidentally detached – the case is completely floatable. Since EcoXpro is made of polycarbonate and is sheathed by rubber, it can survive moderate kicks or drops. EcoXgear offers safe waterproof and shock- and temperature-resistant cases for diverse sources such as iPhone, Android and MP3 players, ranging from small and pocket-size cases to large and powerful stereo systems. All products are available online and payable through trustworthy systems worldwide, coming in distinguishing orange or black color.